MXGP-TV is stoked to have finished out another season of epic racing and shared it live around the world. 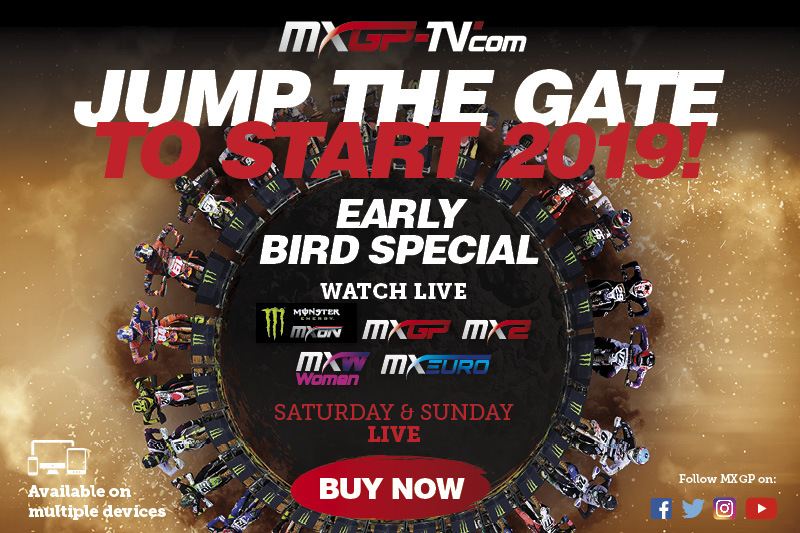 To celebrate the end of the 2018 season we are announcing and opening sales on the 2019 FULL Season MXGP-TV Early Bird Promo. The 2019 MXGP season will travel to new venues in Hong Kong, Shanghai, and more as part of another epic 20-race season in addition to the 2019 Monster Energy FIM Motocross of Nations at the famous TT Assen circuit of the Netherlands. The 2019 Early Bird package gives LIVE and OnDemand access, from any device anywhere in the world, to all of the above including Qualifying Races on Saturday, Sunday’s Championship racing, and LIVE support classes such as WMX, the EMX Championships and more! Will Jeffrey Herlings continue his dominance, will Antonio Cairoli win his 10th World title, or will someone like MXGP rookies ot the 2018 Monster Energy FIM MXoN OPEN overall winner Glenn Coldenhoff rise to the occasion? The only way to see it all unfold live is to tune in to MXGP-TV.com! Don’t miss your chance to save big and watch the stars of the MXGP Championship fight for the 2019 title of Motocross World Champion plus the 73rd edition of the Monster Energy FIM Motocross of Nations! Sign up & Purchase the 2019 MXGP-TV video pass with big early bird discount HERE. Offer lasts until the 20th January 2019! Don’t miss out on the early bird offer! JOIN NOW Below. Subscribe and connect with ASC | Action Sports Connection and MXGP-TV for the most exciting and breath taking motocross action in the world! Less than 100 days to the 2019 FIM Motocross World Championship Season. Line up for 2019 with MXGP! Watch our new Teaser! Exclusive LIVE motocross action guaranteed – Get your MXGP-TV pass today and enjoy over 110 LIVE & OnDemand action hours of MXGP, the FIM Motocross World and European Championships in high definition (HD). Buy MXGP-TV season package now and get access to the exclusive 2 days LIVE as well as the Monster Energy FIM MXoN. With the MXGP-TV pass you will also receive premium access to our famous 26mn video magazine with selected back-stage and action footage. The MXGP VIP GOLD SKYBOX passes will let you experience the FIM Motocross World Championship in style with access to exclusive areas of the venue with the best viewing along with a glamorous breakfast, lunch buffet and continuous refreshments! The MXGP racing is always epic but 2019 will be a whole new level with Jeffrey Herlings defending his first MXGP title while Antonio Cairoli goes for his tenth world championship and young stars like Pauls Jonass enter the mix. There is no better way to have an amazing weekend than to go as a VIP GOLD SKYBOX guest starting with the simple parking of your car in convenient VIP areas to watching the racing from inside the Skybox alongside the worlds best riders, top industry members and more. The service provided by actionsportsconnection.com is based on Internet technology. The quality of video content transmitted over the Internet is directly linked to the quality of Internet access to end users. In no case actionsportsconnection.com nor Youthstream Media SA in connection with services provided on the platform MXGP-TV.COM / ASC | action sports connection can be held responsible for any damages related to the quality of the connection of users of the platform MXGP-TV.COM / ASC| action sports connection to the Internet. note”: to MXGP-TV registered users Only free videos are available on iPad.